Cooking and eating outside always seems to make the food taste better, but you don’t have to forgo your sense of style on our Terraza de las Uvas! 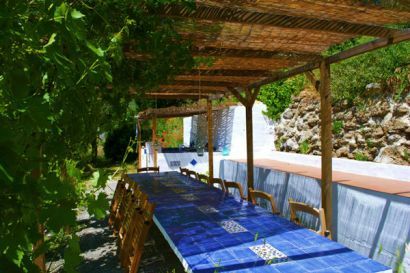 Shaded with vines, hung with fat juicy grapes during the summer months, and surrounded by pomegranate, pear and walnut trees, La Terraza seems to be almost absorbed by the nature that surrounds it. 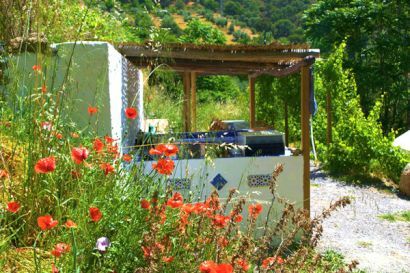 But beneath the vines and shady trees the fully equipped kitchen and beautifully tiled banqueting table give a whole new meaning to the idea of luxury camping. As many of our guests have commented, this certainly has the “wow” factor! 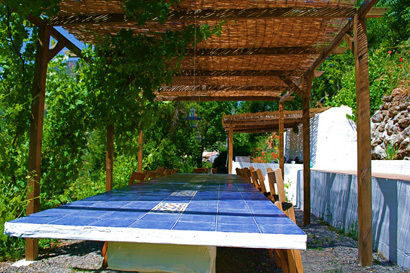 La Terraza de las Uvas is the perfect setting for al fresco dining and socialising and, like all the best kitchens, it also acts as the heart of our Yurt Centre. On holiday with friends and family it will undoubtedly be one of your favourite places to just chat and hang out. 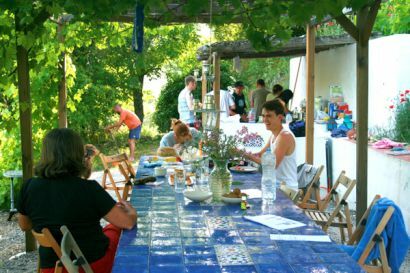 For retreats and workshops La Terraza is also a fantastic break out space, a friendly and informal place for discussions, talks and Q&A sessions, and a wipe-clean area for even the messiest of creative activities! Will you decide to cook up your own culinary creations with the fresh, quality ingredients that Mediterranean Spain is famous for? Or will you choose to just sit back, relax and let us do the hard work with our fresh local produce? We’ll be happy to put together part– or fully–catered packages for you. You can get a mouth-watering taster of what will be in store by looking here: Catering.